Recently our nephew came to stay the weekend. This only happens once a year because he lives in Orlando. 🙁 I asked him if he wanted to make some cookies, and he suggested brownies! I have a lighter brownie recipe, and a brownie with peanut butter chips in my blog already, but I knew I wanted to try something new. With just a quick look in my Martha Stewart Cookies book, I found the perfect recipe. These brownies are everything a brownie should be, chocolatey, rich, moist, and delicious. When The Boy got home from work and we offered him a brownie, the first thing he asked was “Is it cakey or fudgey?”. The Boy and I are both fans of the fudgy brownie variation. These aren’t the fudgiest of all brownies but they’re definitely not cakey, they lie in the middle between cakey & fudgy. 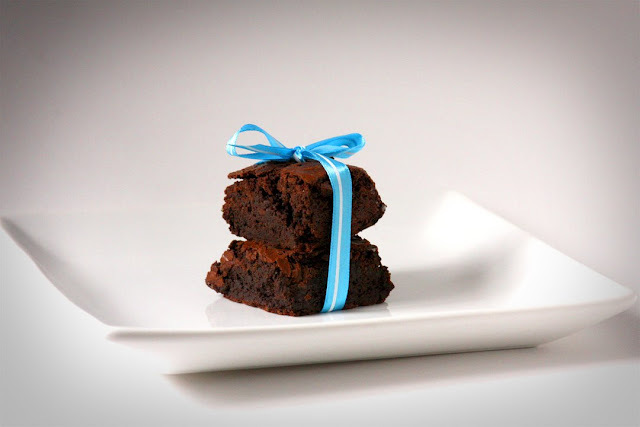 So if you’re looking to appeal to brownie lovers of all kinds, this is the recipe for you. They are still soft & melt in your mouth, but stand up well. If you don’t have a handy little helper like I did to help whip these up, don’t worry, they are still quick and easy to make! okay, you're starting to look like a professional photographer now and I grow increasingly jealous. How cute is that little ribbon? We need to discuss cameras, props and backgrounds because I need some serious help on that front! Also – thanks for the zucchini spice cupcakes. They were absolutely wonderful. People in my husbands office were fighting over the last few. Thanks again! 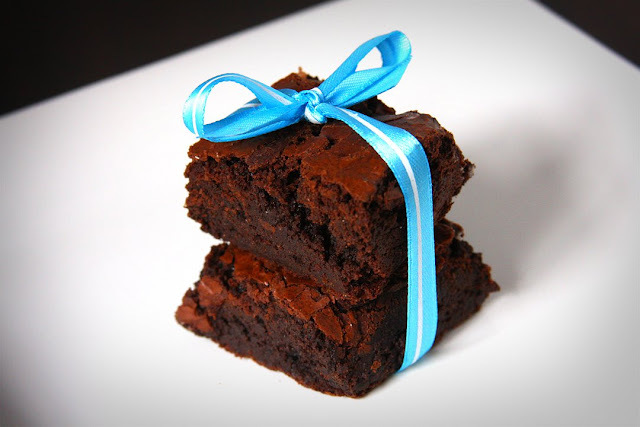 I love the brownies with the ribbon! I'm a huge fan of fudgy brownies too, but this sounds like a great recipe. Mmm. Looks great to me. Love the photos too. Brownies are my favorite. Those look amazing! Holy cow they're so rich it's amazing! omgggggg. i am having a choc craving like right now!! Yum! Looks delish. If you like fudge-y, check out the brownie recipe from the Foster's Market cookbook (out of Durham/Chapel Hill, NC) – they're slightly undercooked in the middle, which make them even better! Also, check out the Brownie Pudding recipe from Barefoot Contessa's newest cookbook (Back to Basics, I think) – so easy and yummy. If you'd like me to email the recipes, let me know – lctarheel@gmail.com.